Braun Chronograph Watch BN0095BKBKBTG Prestige Black. 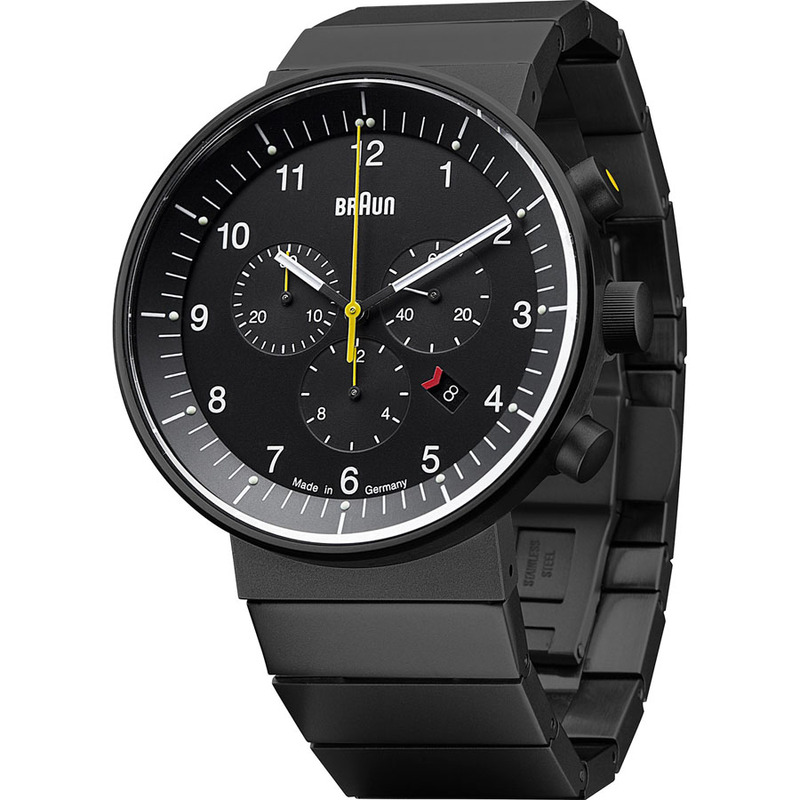 Braun BN0095 analogue watch - German Made. This Braun Prestige analogue watch measures 43mm diameter x D11 thick case. Available in stainless steel or black plated stainless steel. Both versions come with either stainless steel bracelet or rubber strap. The case of this Braun analogue watch is carved of one single block of steel. This one-piece construction eliminates the need for a case-back and in turn removes the element of potential leakage. The Swiss movement is mounted into the case from the top before being covered and sealed by the sapphire crystal. This allowed the Braun designers to taper the bottom part of the watch more elegantly and attach the band lugs in such a way that would not be possible with conventional watch construction. Implementing new technical solutions for the benefit of functionality has always been an important part of the Braun design tradition. The result is not only striking in appearance but moreover the elimination of a case back gives the watch an added structural advantage as there is a better protection against water. 2 year warranty. In stock, usually ships in 1 business days.